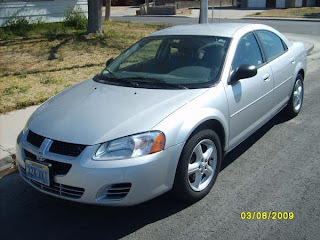 I thought I would do a post letting all of you know that we are selling our car. We have been putting off selling it for a while, it is Kent's baby, but we decided if we are serious about buying a house soon than we need to lower our debt to income ratio (we have two car payments). SO a little about it. 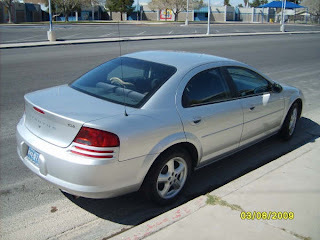 It is a silver 2005 V6 4 door Dodge Stratus. It runs fantastic and we have never had any problems at all with it. It does have a crack in the back bumper, courtesy of me backing up into with our van, but other than that it is beautiful. It has been very well maintained and has fantastic air conditioning, one big reason why we are sad to get rid of it. It has only 59,000 miles on it. We are selling it for $6,400 but are willing to negotiate a little. If you know anyone looking for a pretty car that runs grate, tell them about it. You can post a message or e-mail me about it at tibbitts_2003 @hotmail.com if you have a ny questions.